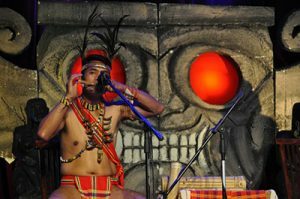 The Rainforest World Music Festival truly came of age this July on its twenty-first outing. What appeared to be near record attendance, an expanded program and idyllic weather (ie. No rain!) the united nations of the rainforest partied in joyous communion over three days and nights. Extra day time mini-sessions featured local acts showcasing traditional instruments, tattoos, crafts and dance with young punters embracing fusions of the ancient and modern. Wellness & Lifestyle and Children’s programs, a Chingay parade and film screenings spread across to the Damai Central site overlooking the South China Sea. 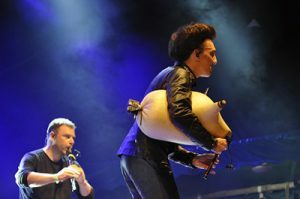 Evening concerts alternated between two neighbouring stages. The on-site air conditioned theatre shows included spellbinding soloists and rhythmic ensembles. There’s always something new to the festival. 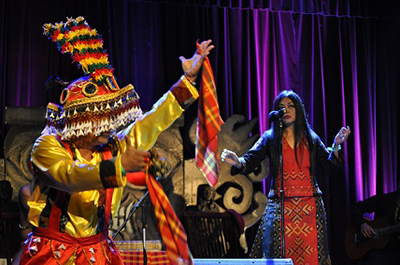 This year introduced Native American Hoop Dancing and storytelling, jazz and pop-infused Byzantine chants, Acehnese body percussion, Mordovian polyphonic vocals, electro Tunisian fusion and a melange of influences from across the Philippines. As always, visiting artists waxed lyrical on the unique vibe of the event where representatives from across the globe form alliances in friendship and culture. Even the crack production team and volunteers represented locals and ‘honorary’ locals. The line-up featured Alberto Mani (Spain), Balkanopolis (Serbia), Bhungar Khan Company (India), Comgo Ginebra (Chile), Danai Kuwai , Djeli Moussa Conde (Guinea), Dona Onete (Brazil), Gayo Gayo (Indonesia), Grace Nono (Philippines), Kevin Locke (Lakota/Anishnabe, USA), Naedrum (Korea), Niteworks (Isle of Skye), Oyme (The Republic of Mordovia, Russia), Raghu Dixit Project (India), Shanren (China), Slobodan Trkulja (Serbia, solo and fronting Balkanopolis), SwarAsia Malaysia (My), Volosi (Poland), Waratoo (Solomon Is) and Yallah Bye (Tunisia). Heritage cocktails captured the essence of RWMF collaboration such as Cuatro Minimal (Mexico, Korea, Japan) and Arat Kilo, Mamani Keita & Mike Ladd (France, Mali, USA). An absolute highlight was delivered by the instrumental duo of erhu master Guo Gan (China) with Ali Keita (Core d’Ivoire) on balafon and mbira. The pair crossed paths at festivals over recent years. Following a casual chat or two and a jam here and there, they hooked up in Europe which led to an unplanned recording session. Their Rainforest concert was their first live performance as a duo. 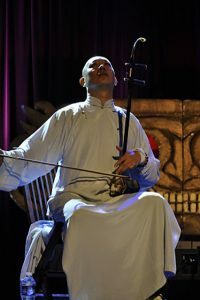 During one exchange, erhu and balafon alternately took the melody line for a unique yet cohesive interpretation. The resulting standing ovation said it all. A magical experience shared between artists and audience. Of Comoros Island trio Elisouma, only one member made it to Sarawak. Eliassse Ben Joma held his own on guitar, kayamb and vocals despite the absence of his colleagues. The players of Comorian harp and Gambusi lute were waylaid by a cancelled transit flight in Bangkok. To finish his theatre show, Eliasse invited a young local trio of vocalists to join him with spontaneous and glorious harmonies. Local Sarawakian acts 24 Drums, Sada Borneo and At Adau were each a major hit with the crowds showing how much has been achieved in the preservation and adaptation of local traditions – from instruments like the sapé (boat-shaped lute) and nose flute (both almost obsolete until the recent revival), to melodies and beats, dance and tribal garb. Since their ‘new talent’ preview shows in 2016, to an early evening gig last year, they rocked the late night Tree Stage this time around. From the crowd surge and wild reception, it seems they’ve arrived as local rock stars in their own right. RWMF2018 had it all – from the wide-eyed enthusiasm of emerging talent to the effervescent radiance of the ageless. 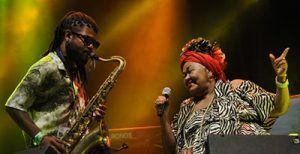 Nearing 80 years of age, Brazilian vocal queen Dona Onete brought her girlish charm and delight to the jungle backdrop far from her Amazonian home. A primary school teacher for most of her working life, Onete declared that she “didn’t want to just lie around in a hammock” in her retirement. So she hit the road with musicians from her region to share her message of love, nature, food, friendship and music. The dancing, cheering thousands fell in love with her songs and beatific smile as she closed the Friday night program at almost 1am. Despite mobility problems, Onete rose from her onstage ‘throne’ to answer an irresistible urge to shimmy a little before the set was done. A timely reminder that we live in what can be a wonderful world.